Falcon Artistry Cosmetic Tattoos regularly participates in events throughout Metro Vancouver and British Columbia, including trade shows and partnerships with outside organizations, to promote education and awareness around specialty restorative tattooing, permanent makeup / cosmetic tattooing and non-profit causes. Falcon Artistry Cosmetic Tattoos is pleased to announce we will be featured as an exhibitor at the Second Annual Van Isle Tattoo Expo. Learn about cosmetic tattoos and permanent makeup. You can also visit our booth at the Victoria Conference Centre in downtown Victoria for eyebrow microblading, lip contours, powder brows and more. 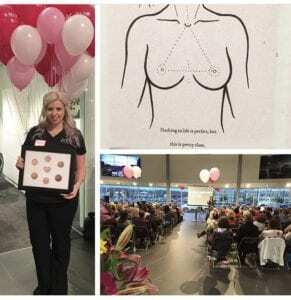 Falcon Artistry participates at BRA Day events throughout British Columbia to help promote areola restorative tattoos and provide resources for survivors post mastectomy and reconstruction. Falcon Artistry Cosmetic Tattoos in Metro Vancouver spent Nov. 2017 in Las Vegas for a full course on advanced techniques for permanent cosmetic tattooing and on cosmetic-tattoo removal to help conquer our goal of being the best shop for cosmetic tattoos and permanent makeup in British Columbia! Falcon Artistry was excited to be a part of the West Coast Women’s Show Oct. 20th, 21st & 22nd, 2017! We participated in the “Fashion & Style” area of the show and had a blast educating people about cosmetic tattoos and permanent makeup! Falcon Artistry had a huge success as the only cosmetic tattoo booth featured at the Van Isle Tattoo Expo. We met lots of lovely people and helped to educate everyone about the wonderful world of cosmetic tattooing and permanent makeup.